Check me out at Red Radar today where I give my lowdown on London Fashion Week! Oh and I’m on Fashion Capital talking about the great show by Bora Aksu! Going back to a lovely September week in London, I made some lovely friends who work for a fabulous company called www.fashioncapital.co.uk which is the sister company to Fashion Enter in the UK, which offers support, mentoring, professional advice, seminars and retail space aimed at up-and-coming designers and students. It’s an amazing mechanism for any designer who needs some TLC from the people who know best with the goal of making it big in the big bad fashion world. If you are around London and want to check out some great designers well this is right up your street. British fashion designers have a new home in London W1 as British Designers @ FashionCapital. The boutique store, which also features a unique showroom space for designers, press and buyers, can be found at 2 Seymour Place, W1. The British Designers @FashionCapital boutique will showcase the very best of British fashion design including the likes of – Emma Cook, Felder Felder, and Atlanta Weller – the impressive list goes on. The boutique will not only house key designers from the London catwalks but will provide space and support for up and coming talent too. established names will see the industry’s ones to watch, new designers making a stir in the fashion world. London is at the cutting edge of design talent and this unique boutique and showroom will showcase the newest and brightest fashion creative. Collections across ladieswear, menswear and accessories will be sold at the W1 boutique, located just a stones throw away from Marble Arch. following a launch in Milsom Place in Bath earlier this year. There are also plans to open in Hackney early in 2011. Right so today was the best day of my life. Full stop. The day started by making a dash across the Waterloo Bridge to the fine venue and my home for the next three days, Somerset House. 9am. Paul Costello. Ultra feminine and beautiful. I felt like I was being taken back to the days of “Summer Holiday”. Retro yet contemporary with a feel of modernism with the use of muted metallics, creams and greys. The highlight – his six sons taking to the stage in some classically tailored suits. Yum. 10.15. Maria Grachvogel. Now here I was lucky enough to score a third row seat. Maria’s look for the warm season uses the maxi print dress (once again), some classic tailoring and well constructed pieces. I loved the use of grey in this collection, making it known as a warm colour. This collection had such a beautiful element of fluidity to it, using silks and light cottons to create movement in each piece. Also lots and lots of yellow! 11.00 Time for a coffee and and a bit of note writing. I head to the press room where I meet the fabulous Jemima Daisy from www.fashioncapital.co.uk which is the larges fashion web portal in the UK. We instantly hit it off and now I have a new friend in London! She’s busy uploading articles and pics from Day 1 and whilst she is busy doing that, I head to the MAC salon for a chat with the lovely make up artists. I get a fabulous make over and try some new colours for my new hair (for those of you who don’t know, I am now a brunette!). With the use of satin eyeshadows, like Prunella and Shadowy Lady coupled with some lipstick called Myth, I have the perfect make up palette for my new look! 12 noon. Time to check out the exhibitions where I fall for Orla Kielys’ new collection on display at the Portico Rooms. The collection has a real vintage feel and again is so feminine. Prettiness looks like the latest trend for the new season and I see that nearly all the designers I have seen so far have taken a step back in time. 12.30 I head to the fabulous scarf collection from Jane Carr which is actually stocked in BTs! Taking inspiration from a road trip across America, I love this one scarf with Route 66 as its print! It has such a festival feel. Imagine taking a trip into the unknown continent, roof down, wind blowing in your hair, Jimmy Hendrix on the radio and one of these scarfs adorning your crown? 12.45 Get a look from Calum Best as I traverse the concourse on the way to the ladies. The brown hair has the desired effect. If even from the star of Celebrity Love Island Seasons 1 – 100. 1.00 Lunch. Yes people at fashion week take a break for a lovely sambo from Tom Aikens deli kitchen. 1.30 Head back to press room to re convene with Jemima for a re cap of the events so far and to make a plan for the remainder of the day over a nice cup of peppermint tea. 2.30 We head to the Freemasons Hall for the Vauxhall Fashion Scout where the new designers fresh into the industry display their wares. 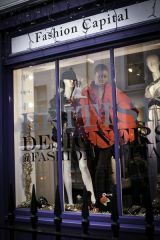 I meet up with my new found friend in fashion, Mark Andrew Kelly who is looking after front of house. We join the queue for the anticipated Ones to Watch which turns out to be great not only for having seats in the 2nd row this time. Not only beacause I am sitting directly opposite the head of womenswear for ASOS. But actually because I totally fell for new designer Lilee, whose use of pleats, chiffon and layers overwhelmed me. Watch out for this one! 5.00 Jemima and I decide it’s time for a little glass of vino to toast day one and celebrate meeting new friends. Day two – Oksam, John Rocha, Guggis new collection on display at Dover Street, and lots more new designers at the fashion scout. Also going to try really hard to get into Sass and Bide! styleisle out. Back tomorrow for more from the LFW adventure!